Political relations between the Jewish State of Israel and the Federal Republic of Germany will always have aspects that transcend normal foreign relationships. I would say that her conviction never changed, but in the current environment and the administration of the Foreign Ministry, you will also find a very different attitude today. After World War II, German-Israeli relations were a project of the political elite in Germany to help Germany integrate into the family of nations despite its horrible and criminal past. Relations with the nation-state of the Jewish people were an indispensable tool for this purpose. Likewise, the younger generation within the German civil society of that era took up the question of the German responsibility for the Shoah. The Deutsche-Israelische Gesellschaft and the Gesellschaft für christlich-jüdische Zusammenarbeit, two concrete non-partisan projects, were motivated by this approach of responsibility. In the 21st century Germany, responsibility for the past is no longer a popular central motif motivating good relations between Israel and Germany. As the aspect of responsibility for the past loses importance, the image of Israel’s role in the Palestinian-Israeli conflict weakens the support for Israel’s security among the German public. The public is not well informed about the history and presence of Israel. More and more, a narrative has taken over that decontextualized the conflict between Israel and the Arab-Palestinian neighbors. In the mind of the many, the history started with the occupation of Gaza and the West Bank. Forgotten are the War of Independence against the attacking Arab countries that denied the Jewish people their own state, the Arab aggression before the conquest of the Jordanian-occupied West Bank and east Jerusalem, as well as the Egyptian-controlled Gaza Strip. The German media often portrays the actual conflicts between Israel and Gaza or actions in the territories unfairly or absurdly.10 Headlines like: “Israel threatens with self-defense”11 are not uncommon. Often, only the Israeli response to Palestinian attacks finds its way into the headlines.12 By this, Israel is portrayed as the aggressive occupier. Projects of the actual Israeli political coalition, e.g., the NGO law, the discussion about the nation-state bill, or the regularization law, are perceived as shrinking the space of Israel’s civil society or promoting nationalist settler positions, nourishing German doubts about Israel’s willingness to achieve peace. They also discredit Israel’s vital security interests. These problematic projects make the international and German public forget that Israel has always chosen “land for peace” if there is a realistic chance for it, as was done in the Sinai with Egypt, in Lebanon, and in Gaza, even though this has not always met with success. Here, the majority of the Knesset could be clearer about Israel’s identity as a Jewish AND Democratic state15 than it was in this current legislative session. Holocaust education today is insufficient to fight anti-Semitism and encourage friendly relations between Germany and Israel. Besides countering anti-Semitic, anti-Zionist attitudes, it is crucial to teach the history of the Zionist movement and the founding of the Jewish and democratic state, as well as the history of the conflict between Israel and its neighbors. We have to stabilize our relations with the perspective of the future, with common values and common interests. It is evident that in Germany there is a deep – I would not say misunderstanding but – “not understanding” of Israel’s security situation. For Germans, security is mostly about burglary and theft, very rarely about terrorism like the horrific truck terror attack on Breitscheidplatz in Berlin in 2016, and certainly not about war. That security in Israel means survival and defending its existence seems very far away. The ignorance toward this challenge is fueled by a German narrative how a non-aggressive foreign policy could work out for the good. One of the consequences in Germany after World War II in 1945 was: “Nie Wieder Krieg! [No more war! ]” This attitude was best expressed in the German “Entspannungspolitik [policy of détente]” under the slogan “change through rapprochement,” a concept of foreign policy drafted by the foreign policy expert of the Social-Democratic Party, Egon Bahr.20 This concept has deeply influenced German policy concepts of all parties. What worked very well with the Communist East is now often applied also toward Putin, Erdogan, and Iran. The Bahr approach in German foreign policy, as well as a geopolitical situation surrounded by peaceful neighbors, results in a deep lack of understanding of Israel’s situation – both in public as in the political class. The term “proportionality,” applied so often in Israel’s conflicts, is not perceived as using force most delicately and only as the last remedy, but strictly as a comparison in the number of victims. By this, since its victory in 1967, Israel is seen as the strong giant with nothing to fear. If there is no peace agreement, according to this attitude, it is because of the lack of Israel’s will and not the lack of a responsible and reliable Palestinian leadership and a security framework for the implementation of any achievable agreement. After the disastrous diplomatic developments of 2017, Germany’s new foreign minister, Heiko Maas, showed a different attitude than his predecessor. Stating that he entered politics because of Auschwitz, Heiko Maas denies the gestures of Gabriel teaching Israel the definition of democracy. 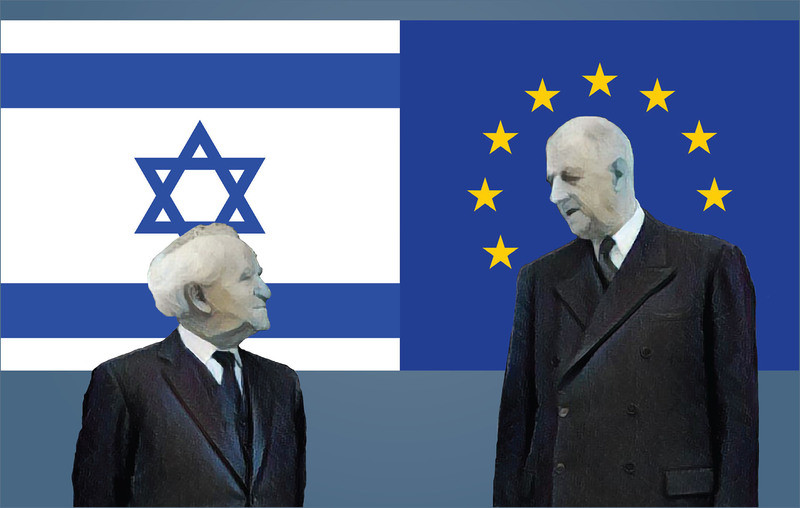 Maas goes back to the fundaments of German-Israeli relations as a reflection of responsibility for the past. The future will tell if Maas will take over the Foreign Ministry or the ministry will take over him. Statements this summer on Iran show no change until now on subjects where Israel’s security is concerned. On the Iran issue, Maas seeks to defend the existing JCPOA agreement without challenging Iran on Hizbullah and its armament program.21 He even warned on Twitter22 that a regime change in Iran would bring “radical and fundamentalist forces” to power. 1. We should advocate for fair treatment of Israel in international bodies. The German government does not need to love Prime Minister Netanyahu and Israel’s current government. As our countries are both diverse democracies, we can continue to discuss issues like Heimatministerium,23 the nation-state bill, or others in a non-confrontational way. Despite these controversies, we should respect the Israeli government as democratically elected and stand up when Israel is singled out in international forums: in the UN Human Rights Council, UNESCO, ECOSOC,24 the General Assembly of the United Nations, and elsewhere. The European Union27 and Germany28 pay a huge share to the budget of the Palestinian Authority. According to Israel’s prime minister, the Palestinian Authority pays $350 million to terrorists and their families.29 The Palestinian Authority and the PLO have two pension systems for endorsing prisoners and the surviving relatives of so-called martyrs.30 And this is an incitement to terrorism. The German government excuses itself in arguing they do not directly fund those terror pension systems. But it is evident that only because of foreign aid, the Palestinian Authority has the financial flexibility to act like this. Stopping this terror financing system31 should at least be a condition for future payments from the budget of Germany, as well as from the budget of the European Union. 3. We should engage more actively against the Iranian threat to Israel. If Germany wants to remain within the E3’s nuclear agreement with Iran, it should at least try to address the problem of the Iranian missile program and the Hizbullah issue. Being a friend of Israel and declaring its security as a German raison d’état, Germany cannot close its eyes any longer in the face of this existential threat to Israel’s existence. 4. In the European Union, we should lobby for labeling all goods of occupied and disputed territories or none. According to the legal standpoint of the German government and European Union, the territories outside the 1967 borders controlled by Israel are occupied territories. Even if their status is unclear because they were occupied before by Jordan or controlled by Egypt, international law forbids the settling of citizens of the occupying power in such territories. In trade, there must be a differentiation between goods of the states and the territories they control. The European Union, therefore, asked for labeling products of the territories differently from the products from the State of Israel. However, there are other unresolved conflicts like this, such as the Kingdom of Morocco and Western Sahara. In none of these conflicts has the European Union demanded the labeling of the products of the occupied entities. Therefore, if the European Union is applying international law, then it should be done for all comparable cases. If it is only demanded from Israel, the Jewish and democratic state, then it is anti-Semitic, and Germany should put a stop to it. The Federal Constitutional Court has stated in settled case-law that the subject of international law “German Reich” has not perished and that the Federal Republic of Germany is not its legal successor, but identical with it as a subject of international law (BVerfGE 36, pp. 1, 16, see also BVerfGE 77, pp. 137, 155). Bundestagsdrucksache 18/5178 15.06.2015 p. 4; Bundestagsdrucksache 18/4076 20. 02. 2015, p. 10. The latest submarine demand is subsidized with €540 billion. The corruption suspicion against Prime Minister Benjamin Netanyahu is endangering the acceptance of this military supply framework in the German political class. They are not: Ori Mark showed that the settlements are not a main obstacle to peace. Ori Mark: How Many Settlers Need to Be Evacuated to Make Way for a Palestinian State, Haaretz, 18. 8.2018. https://www.haaretz.com/israel-news/.premium.MAGAZINE-how-many-settlers-need-to-be-evacuated-to-make-way-for-a-palestinian-state-1.6386939. A good example for a clear position: Tzipi Livni, “There’s a Reason the Opposition Didn’t Attend the Nation-state Protest.” Haaretz, August 17, 2018. https://www.haaretz.com/opinion/.premium-there-s-a-reason-the-opposition-didn-t-attend-the-nation-state-protest-1.6386894. Sozialhilfe für Gewalt und Terror? Die Zahlungen der Palästinensischen Autonomiebehörde an palästinensische Häftlinge und sogenannte Märtyrerfamilien 2017. (Mideast Freedom Forum Berlin, Berlin, 2018).